Destruction wrecked by flood in the last 24 hours in Cumberland and immediate vicinity will reach $3,000,000, according to conservative estimates this afternoon. Damage to street, water and sewer systems and city property in general will run close to a million dollars, according to Mayor George W. Legge. Business houses, homes, railroads and other damage will total another two millions, according to an approximate survey quickly made. 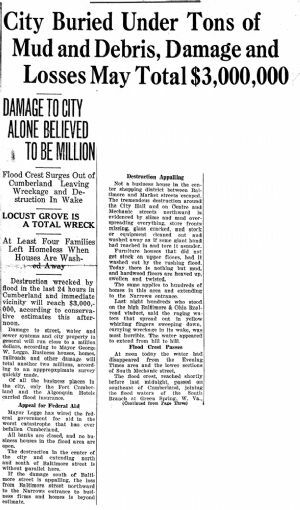 Of all the business places in the city, only the Fort Cumber land and the Algonquin Hotels carried flood insurance. Mayor Legge has wired the federal government for aid in the worst catastrophe that has ever befallen Cumberland. All banks are closed, and no business houses in the flood area are open. The destruction in the center of the city and extending north and south of Baltimore street is without parallel here. If the damage south of Baltimore street is appalling, the loss from Baltimore street northward to the Narrows entrance to business firms and homes is beyond estimate. Not a business house in the center shopping district between Baltimore and Market streets escaped. The tremendous destruction around the City Hall and on Centre and Mechanic streets northward is evidenced by slime and mud over spreading everything, store fronts missing, glass cracked, and stock Or equipment cleaned out and washed away as if some giant hand had reached in and tore it asunder. Furniture houses that did not get stock on upper floors, had it washed out by the rushing flood. Today there is nothing but mud, and hardwood floors are heaved up, swollen and twisted. The same applies to hundreds of homes in this area and extending to the Narrows entrance. Last night hundreds who stood on the high Baltimore & Ohio Railroad viaduct, said the raging waters that spread out in yellow whirling fingers sweeping down, carrying wreckage in its wake, was most horrible. The water appeared to extend from hill to hill. At noon today the water had disappeared from the Evening Times area and the lower sections of South Mechanic street.